Aaron Taylor from Stantec discusses the design-led approach to creating a new entrance building at The Ellen Wilkinson School for Girls in Ealing, a key element of the campus that aims to connect the school with the local community and maintain high student aspirations. Named after the UK’s first female Education Minister, The Ellen Wilkinson School for Girls in West London continues to inspire young women with her legacy of female achievement. Ealing’s only all girls comprehensive, with more than 1,400 students, has seen many additions and alterations to its campus over its 40-year history, creating an eclectic mix of buildings. The campus previously lacked a core building that articulates the achievements, aspirations and ambition of both the school and its students within its own estate and beyond. Following a masterplanning exercise by Stantec for the whole campus, a new Learning Resource Centre (LRC) was designed for The Ellen Wilkinson School for Girls, and completed in 2012. 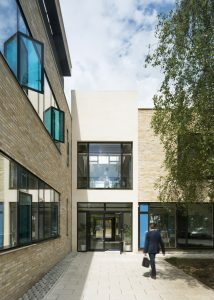 Since then, the school has worked towards delivering the new Entrance Building, which not only combines a dedicated reception and admin block with an expansive gallery space, but also creates a statement of quality and endeavour on entering the campus and a model for future construction projects at the school. The senior leadership team was keen that the new Entrance Building reflect the high standards of the school within its campus and also communicate them to the wider community. The vision was for a statement building that would use quality materials along with spatially-efficient design to provide a facility with an extended service life and an aspirational aesthetic. Part of the design challenge for the new building was the need to create cohesion both with the existing campus of disparate teaching blocks and the local community. 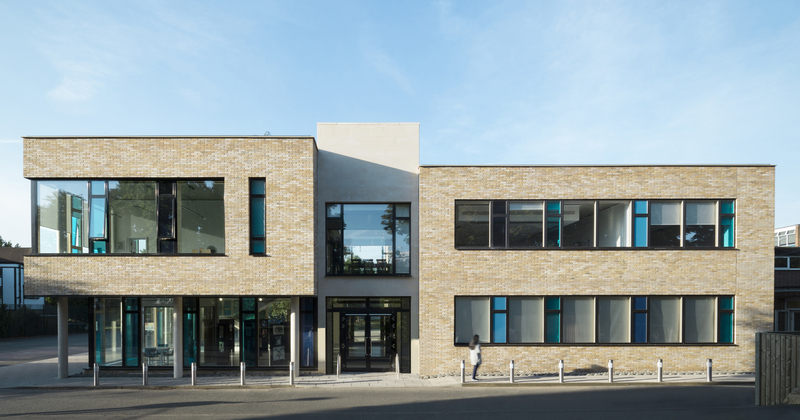 The school is located on the periphery of a conservation area and there was also a need to complement and reference the local built environment while creating a forward-focused, contemporary building with simple lines and open plan spaces. The Stantec team’s response to these design cues was to develop a modern brick building with an active frontage and extensive use of glazing to provide engagement with the local community and open up the exhibition gallery space beyond the confines of the campus. 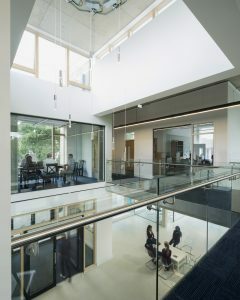 A double height atrium in the centre of the building creates a sense of openness and transparency to welcome staff, students and visitors into the building, while the recessed glazed frontage of the ground floor serves to create an impression that the heavily-glazed first floor elevation is extending the galley out towards the community. A neutral palette for the façades creates contrast with the glazing while referencing the composition of the recently completed LRC. Blue glazed panels interspersed in the clear glass curtain glazing not only add interest and a splash of colour to the entrance building, but also replicate a design feature used on the LRC project and connect the new structure aesthetically to existing buildings on campus, some of which feature blue panels or cladding. External columns supporting the first floor space create a practical covered external walkway from which the ground floor gallery space can be seen from the external area. They also extend visual commonality with the LRC, located just 75m away, where similar slimline columns have been used as part of a simple and unfussy aesthetic. High quality, traditional and tactile materials have been used to execute the aesthetic vision across the façade, with brick providing contrast with British stone. The high-quality finish and simple aesthetic of the Entrance Building’s exterior is also reflected throughout its interior. The atrium not only brings ample natural light into the building but also defines the flow of the facility, with a reception area and open plan space in the atrium, admin offices and meeting rooms to the right and the double height gallery space to the left. While the offices and meeting rooms have been designed as a mix of more traditional cellular spaces, the gallery area has been created as a blank canvas that can be used for exhibitions, events and as a flexible classroom or collaborative learning space. Fair-faced concrete walls and resin floors provide unobtrusive, neutral finishes that maximise both natural light from the extensive windows and the energy efficiency benefits provided by the concrete’s thermal mass. Although the 1,000m2 building is below the area required for the school to apply for a BREEAM rating, high levels of insulation, use of the concrete’s thermal mass as a heat store and a solar PV installation on the roof have enabled it to gain an EPC ‘A’ energy rating. While the brief for the gallery space was to create an area where students’ work can be exhibited, this location has also been designed as an adaptable space for changing pedagogies. Not only is the quality of specification and minimalist aesthetic more reminiscent of contemporary private school environments, it is also designed to echo the commercial world. The concept for the Entrance Building at The Ellen Wilkinson School for Girls rests upon the school’s vision of creating an aspirational environment that supports students’ instincts to look forward to what the future might hold for them. It is both the gateway onto a campus that will continue to evolve and a space from which students will begin their transitional journey into the adult world of work.